Little by little, bit by bit, the corpus of Telemann's sacred vocal works is rediscovered. However, as the list is very large there is still a long way to go until we have a full picture of his contributions to the genre of the sacred cantata. Those who think that Telemann composed music which is pleasant to the ear, but rather harmless, should listen to this disc. Here we get three powerful and expressive cantatas. Two of these shed light on the darker side of life in no uncertain terms. The disc opens with a cantata of a happy nature, written for Easter. It begins with a chorus in two sections. After an introverted "Do not weep!" the trumpets enter and the choir sings "Behold, the lion has triumphed". This is partially a re-working of a cantata for solo voice from the collection Fortsetzung des Harmonischen Gottesdienstes of 1731/32. The operatic tenor aria is here put into the mouth of 'the glad Christian': "Just rage, you old serpent! ", referring to the devil as he manifested himself in Paradise. After a recitative we hear a dictum - a literal quotation from the Bible - for alto with basso continuo; the latter vividly illustrates the text. 'The glad Christian' - this time a bass - then sings: "Up, up, redeemed souls, magnify the heavenly king's war". It is in the form of a battaglia, with trumpets and drums. The same character then takes the pitch of a soprano in an aria with an echo, sung by a second soprano, just like the famous aria 'Flösst mein Heiland' in Bach's Christmas Oratorio. The cantata ends with a chorale: "So we celebrate this high feast with heartfelt joy and bliss". The two other cantatas are of a completely different kind. Sie verachten das Gesetz des Herrn Zebaoth is for the 10th Sunday after Trinity. The gospel reading of the day is Luke 19, vs 41-48 which tells of Jesus weeping at the sight of Jerusalem. He predicts its destruction, because the people "despise the law of the Lord of hosts", as the prophet Isaiah stated (Ch 5, vs 24-25), quoted in the dictum which opens the cantata. Telemann's setting of this text is very gloomy, with chromaticism, strong dissonants and modulations. This is followed by a stanza from a penitential song. The following soprano recitative urges the listener to take lessons from the fate of Jerusalem: "He who has ears to hear, let him hear, ready to repent". This leads without interruption to an alto aria in which Germany is warned that it may share Jerusalem's fate: "Do you then not think that God's hand in the end someday might not find you too, horribly to punish your people?" Then follows the hymn 'Straf mich nicht in deinem Zorn' (Do not punish me in your wrath). The soprano aria is in two sections and has no dacapo; the two parts are juxtaposed through a shift in metre. This reflects the text: in the first section it is supposed that many people "desire to increase the devil's realm of sin", but "I shall reform my life in faith", the second section says. The cantata ends with a repetition of the opening dictum. The last cantata links with the subject of the previous one. Here worldly pleasures are juxtaposed with the harsh reality of life which leads to the appeal from St John's first letter (Ch 2, vs 15): "Do not love the world or what is in the world." Two arias comprise strongly opposing sections: the first describes the pleasures of the world, the second states that this is all a matter of "keeping up appearances". The gospel reading of the day is Luke 7, vs 11-17, about Jesus raising the young man from Nain. In the bass aria he is quoted as saying: "Youth, I say to you: arise!". This is meant here metaphorically: man should arise from sin and devote himself to the service of God. The depiction of worldly pleasures in the opening aria is illustrated through extended coloratura on the word "frohlocket" (jubilates). The next soprano recitative is unusually long and has the character of a penitential lecture. It is interspersed with the hymn 'Du, o schönes Weltgebäude": "You, o beautiful world, your seeming joy is merely a cover for pure fear". The cantata ends with a chorale: "Make heaven always sugar-sweet for me and this world bitter as bile". This is a Telemann you don't hear that often - or, rather, who is mostly overlooked. The latter two cantatas are very baroque in their use of images - both textually and musically - depicting sin and the reality of death as its effect. This is Telemann at his best in the musical illustration of the text and its meaning, in sometimes passionate arias, sermon-like recitatives and in the effective use of instruments. Hermann Max was an early advocate of Telemann's vocal music, and he shows here again his faculty for exploring the full dramatic power of his cantatas. The Easter cantata has the brilliance which reflects its character, whereas the message of the other two cantatas is incisively conveyed. The four soloists are simply outstanding; the recitatives - which are often the weak spot in performances of baroque cantatas - are perfectly executed as a speech on music. The orchestra delivers very colourful performances. 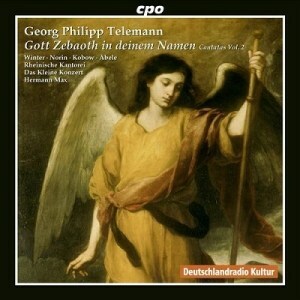 A disc to treasure which shows Telemann and the performers at their very best.